ATHENS, Greece – HASSELT, Belgium – 25 April 2018. WIND Hellas announced today the launch of its new multi-screen pay TV service. The solution is built and operated by Zappware as a turnkey service. “Our end-users will now be able to enjoy a unique TV experience. A smooth integration of all available content in a state-of-the-art video solution is now available on all screens with WIND VISION. Users are now one click away from their favorite channel, sports game or Netflix Series. WIND VISION serves set top boxes and mobile devices in Greece from Zappware’s cloud-based back-office. We are excited to enrich our current offer with this advanced entertainment service, the first in Greece with Android TV and Netflix. We now look forward to growing our business with our new attractive household propositions”, said Hermann Riedl, Chief Strategy & Digital Transformation Officer of WIND Hellas. 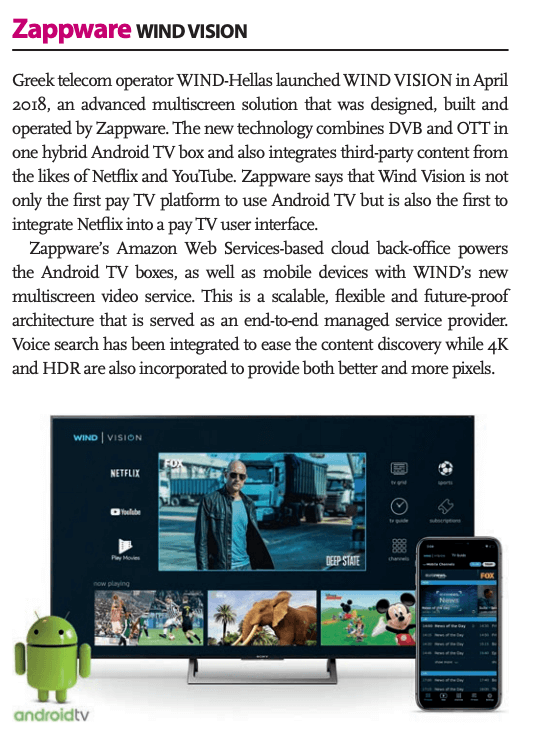 “Zappware was able to leverage some great opportunities that new technologies offer: firstly, in this deployment for WIND, we are combining DVB and OTT in one hybrid Android TV box. Secondly, by using Android TV, the integration of third party content from e.g. Netflix and YouTube is done in an efficient way, resulting in a great user experience. 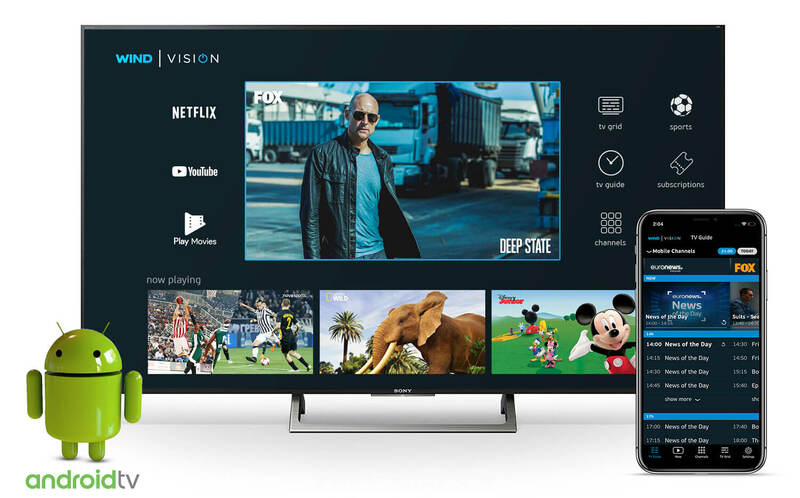 Thirdly, our Amazon AWS based cloud back-office serves the Android TV boxes as well as the mobile devices with WIND’s new multiscreen TV service. This is a very scalable, flexible and future-proof architecture. Proud to serve WIND as an end-to-end managed service provider”, said Patrick Vos, CEO of Zappware. WIND Hellas was founded in 1992 and is one of the largest telecom operators in Greece, offering a full range of telecommunications services: from fixed-line and mobile telephony, broadband services and ICT solutions. WIND is a heavy investor in new technologies and infrastructure in Greece, having invested over €3bn over the years. Its current investment plan is primarily targeted at new generation networks such as 4G and FTTx. Since 2017 WIND has developed its own fiber optic network, offering its customers ultra high speed Internet connection.